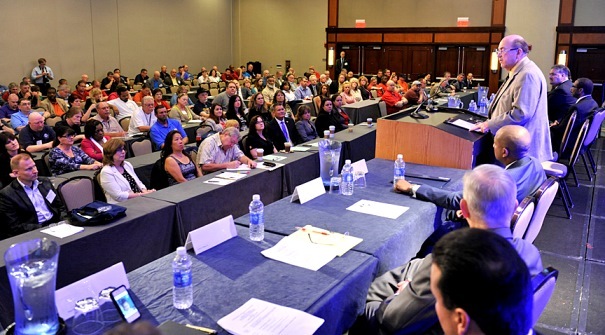 Hundreds of IAM political activists are in Washington, DC this week to lobby for workers’ rights on Capitol Hill during the 2014 IAM Legislative Conference. Lawmakers on Capitol Hill are bracing themselves for an onslaught of Machinists Union activists this week. 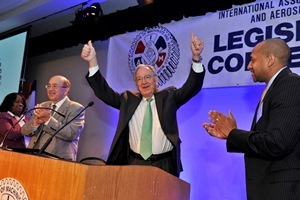 Speakers kicked off the 2014 IAM Legislative Conference in Washington, DC by calling for an end to sequestration, trade agreements that benefit people instead of corporations and a renewed respect for federal workers. 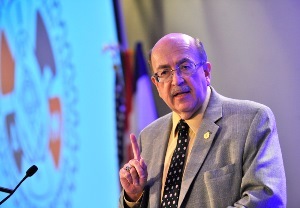 IAM International President Tom Buffenbarger laid out an aggressive pro-labor agenda is his keynote address at the 2014 IAM Legislative Conference. Buffenbarger and others railed against sequestration, now in its second of 10 years of mandated budget cuts, which has taken away job security from federal employees and contractors and harmed national security. The Trans-Pacific Partnership, a secretly -negotiated free trade deal that promises jobs but instead will export thousands of jobs to low-wage countries, is “the biggest threat to the American worker since NAFTA,” said Buffenbarger. When IAM members meet with their members of Congress, they’ll also fight against the privatization of the Tennessee Valley Authority, oppose a law that would allow operators of multi-employer pension plans to cut benefits for current retirees, and support the full reauthorization of the Export-Import Bank so U.S. companies can compete fairly with global competitors. Speakers at the conference so far have included Acting Deputy Transportation Secretary Victor Mendez, AFL-CIO Transportation Trades Department President Ed Wytkind, DC Delegate Eleanor Holmes-Norton, Sen. Mark Heinrich (D-NM) and Sen. Tom Harkin (D-IA), who is retiring after almost 40 years in Congress. Harkin, the first non-union member to be inducted into the Iowa Labor Hall of Fame, said the right-wing assault on labor unions is also an assault on the middle class. A report from the Center for American Progress shows how as union membership rates have decreased, so have middle-class incomes. Follow the IAM’s Twitter account, @MachinistsUnion, for continued updates from the 2014 IAM Legislative Conference.